The SCGO Great Garlic Harvest of 2017 has begun. 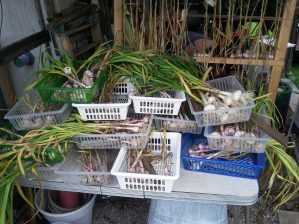 We pull up only the garlic that is ready, with 2-3 leaves dried out. Since there are over 75 types, we need to keep them separated and named through digging, carrying, cleaning, rinsing, and hanging to dry for a month.